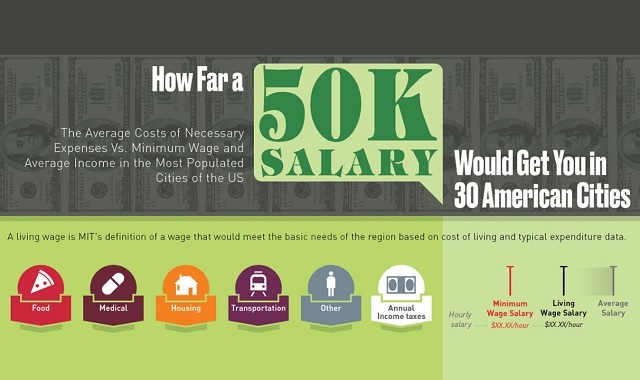 How Far a 50K Salary Would Get You in 30 American Cities #infographic ~ Visualistan '+g+"
Have you ever wondered what you could afford on a specific salary each year? Let's take $50,000 per year for example! This infographic from TitleMax looks at how far that salary would get you in 30 different cities across the United States. It looks at the average costs of necessary expenses versus minimum wage and average income in the most populated cities in America. The factors weighed include food, medical, housing, transportation, and more. The biggest comparison on this infographic looks at El Paso, Texas versus San Francisco, California. In terms of average salary alone, the average salary in San Francisco is 111.6% higher than it is in El Paso!